After completing the 18 locks on the Ashton Canal yesterday both of us comment how much easier it was to do narrow locks. 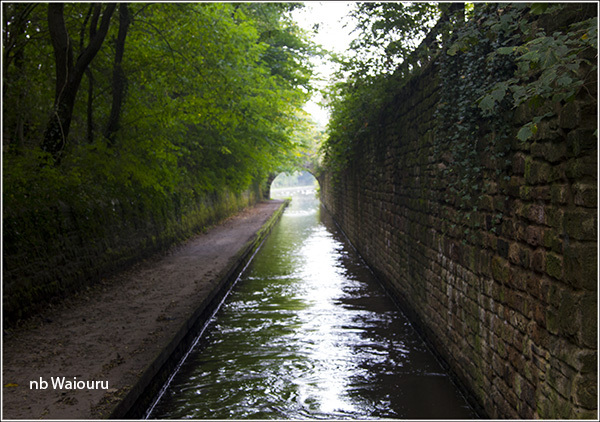 Last night we moored on the Peak Forest Canal about 500 metres from Dukinfield Junction. Jan had recorded the latest episode of New Tricks on the small TV last night and before we left this morning I managed to edit and convert the AV file to DivX format before saving it to the media tank. I'd anticipated taking a number of photos of today's cruise along the Peak Forest Canal but seemed to spend much of my time down the weed hatch instead. The first couple of times resulted in the removal of unwanted objects but then we seemed to acquire phantom objects. The wake would bubble out one side of the rudder and Waiouru felt as if it was being held back. Eventually I came to the conclusion that the canal must be so shallow we were carving a groove along the bottom. 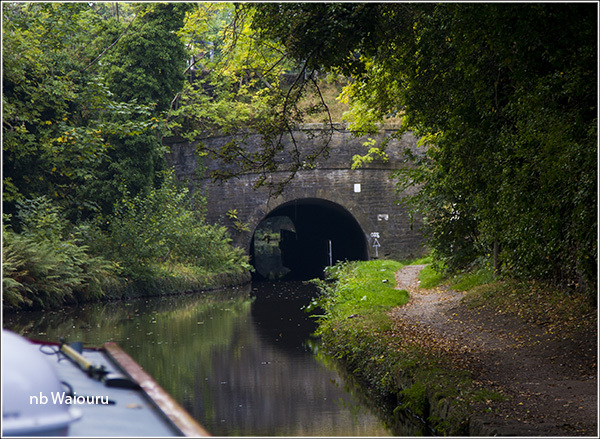 Progress through Woodley Tunnel was particularly slow. 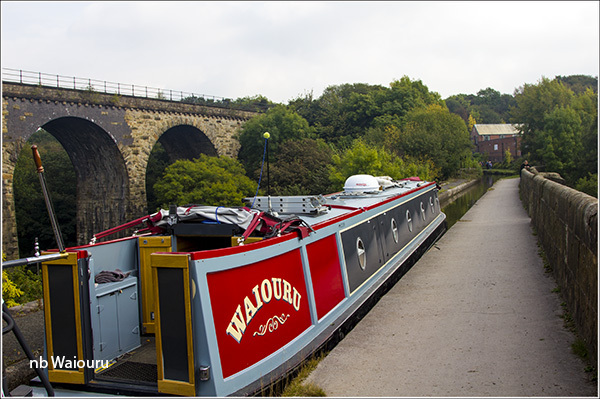 Just before Chadkirk Aqueduct we met our first moving boat for the day. They hovered whilst we attempted to slide past. That didn't work because we ran aground. I was wondering why the other boat wasn't attempting to pass us when Jan pointed out a limb of a willow tree was protruding across the other half of the canal. We managed to reverse back so they could detour around the obstruction, but they had also decided to reverse. Eventually everything was resolved and we reached Hyde Bank Tunnel. There was still a problem with the depth of water because we bounced over a large mud bank at the western end. 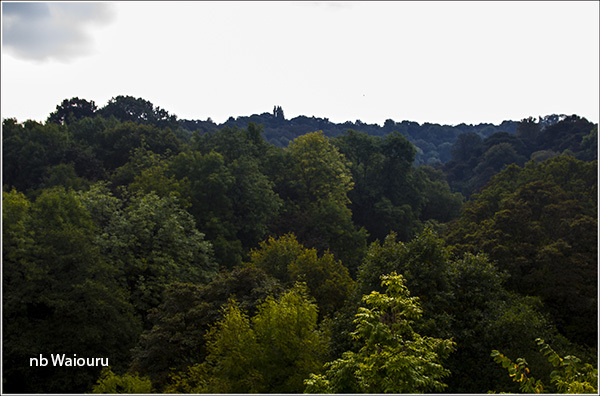 Shortly thereafter we reached Rose Hill Tunnel. As you can see from the above photo, it has a very high roof! 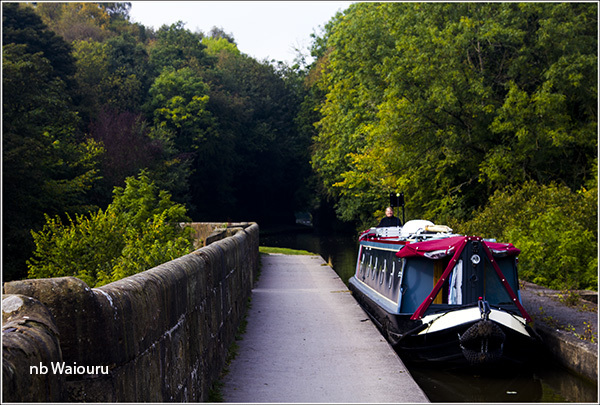 Despite us cruising the Peak Forest Canal in 2007, neither of us could remember any of the canal until we reached Marple Locks. 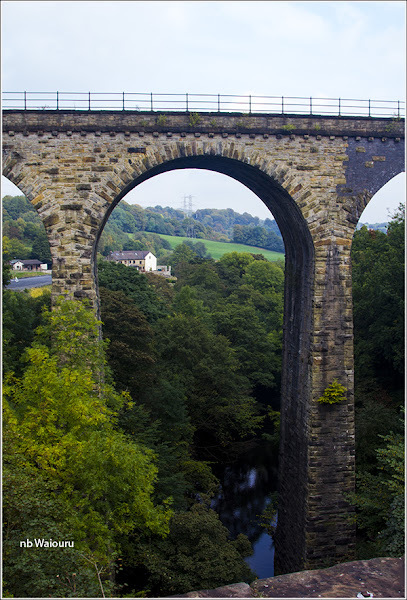 We didn't remember Marple Aqueduct and you would expect us to have done because it's so imposing. 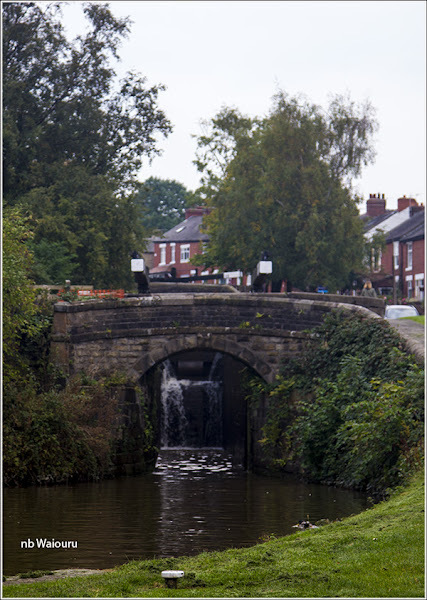 We reached the bottom of the Marple Flight just after midday and had decided to stop for the day. However during lunch Jan suggested we go up the flight. It's possible this comment might have arisen because there was no TV signal below the bottom lock. But then I might be wrong about that! Something I noticed in a couple of the locks. 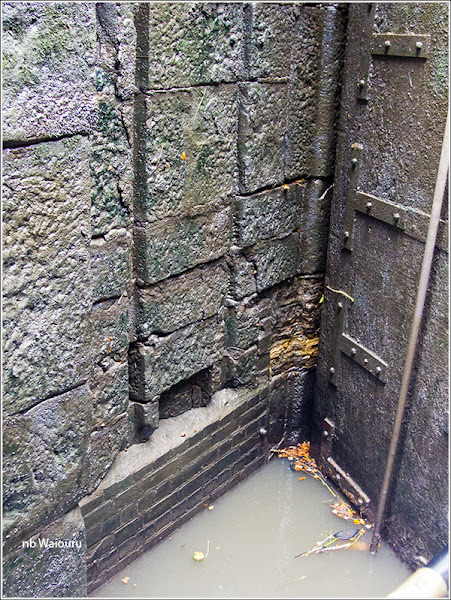 Behind the lower gates were grooves in the masonry which looked like they might have been constructed for ground paddle rods. Then in the top lock I noticed what appears to be a bricked up opening for a ground paddle. I wonder if I’m correct and when the paddles were relocated to the gates? It took us just on three hours to complete the 16 locks. They were all against us and we didn't see any boats coming down. Three quarters the way up the flight I asked Jan if she would like a 'takeway' dinner instead of having to cook. I know.... I'm just that kind of a guy! I even volunteered to walk in to Marple to buy it. 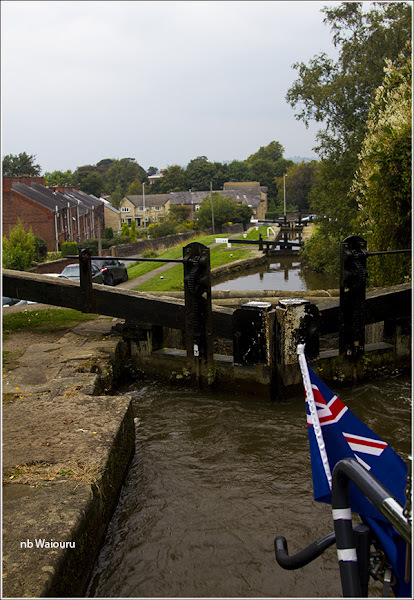 We continued on up the flight reaching the top lock at 5.30pm. 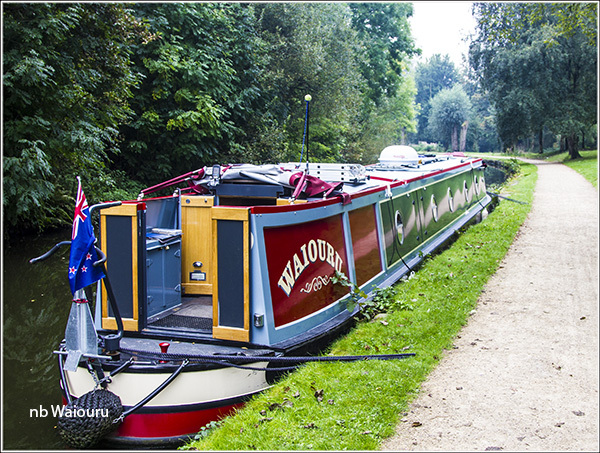 The problem for us was the 48 hour moorings at the junction are in the same poor condition that we found in 2007. We couldn't get any closer than a metre from the towpath. In the end we decided to continue towards Whaley Bridge where we eventually stopped on a good piece of steel piling about a kilometre from Marple Junction. That's when Jan mentioned we had nothing to eat. Now I'm not fooled by these comments. I've been with this girl for almost 43 years and I know she can produce a tasty meal from fresh air and water. And so it came to pass that we sat down to a delicious dinner. We have both the dot and DTV signals. Shortly after mooring the heavens opened and the liquid sunshine fell. I do like a happy ending! Late start…. but got there!